Life as we know it - Life as it could be! 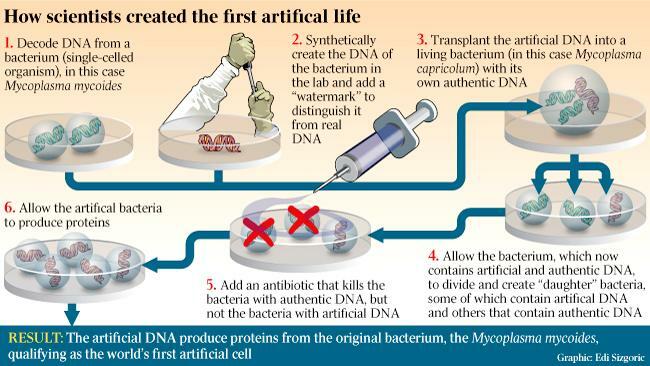 As a development of that ongoing effort, last week Venter announced in the pages of Science magazine that his research team had – by putting together a living and replicating bacterium from synthetic components, inserting a computer-generated genome into a cell – "created life" in the laboratory for the first time. The experiment suggested the possibility of creating bacteria to perform specific functions: as producers of fossil fuels or medicines. "This is the first synthetic cell that's been made and we call it synthetic because the cell is totally derived from a synthetic (gene-bearing) chromosome, made with four bottles of chemicals on a chemical synthesiser, starting with information in a computer," Dr Venter said. Venter first came to international attention as the biologist who attached himself to the painstaking $5bn, 15-year programme to decode the human genetic blueprint, "the book of life" Human Genome Project and announced that he could do it much more quickly and much more cheaply with private capital.